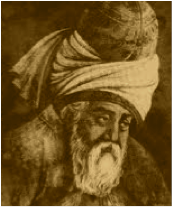 A Year of Being Here: Jalal ad-Din Muhammad Rumi: "You Are the Only Student You Have"
Jalal ad-Din Muhammad Rumi: "You Are the Only Student You Have"
You are the only faithful student you have. All the others leave eventually. "You Are the Only Student You Have" by Jalal ad-Din Muhammad Rumi, from Feeling the Shoulder of the Lion: Poetry and Teaching Stories of Rumi, versions by Coleman Barks (Shambhala, 2000). Art credit: "Rain in the Orchard," 12"x12" oil on panel painting of a Sauvie Island (Oregon, USA) landscape by Randall David Tipton.